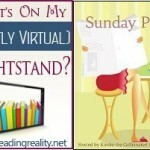 Review: Desert Hunter + Pets in Space 3 Spotlight + Giveaway – Escape Reality, Read Fiction! Because Desert Hunter is a short story, this is going to be a short review. Especially since I have plenty to share with you about Embrace the Passion: Pets in Space 3 – the anthology that this story is included in. 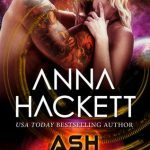 Desert Hunter is also part of Anna Hackett’s absolutely marvelous Galactic Gladiators series. The story of the Galactic Gladiators and the women (and men) who love them begins in Gladiator, but Desert Hunter is a fine story to give you a taste of this fascinating world. 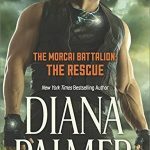 The hero and heroine of Desert Hunter are neither gladiators nor are either of them part of the kidnapped Earth crew – not that they don’t have ties to both. But those ties are tangential to this story. Bren, Mersi and the all important Fiend are all Carthago natives, and the inherent cruelty of the place and its corrupt power structures have scarred them all. Bren and Mersi’s romance is a combination of the classic tropes of friends-into-lovers and hero-feels-unworthy. Yes, I know that second one isn’t really a named trope, but it ought to be. Bren and the caravan captain Corsair saved Mersi’s life back when she was a runaway slave. 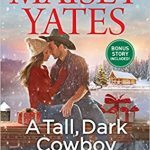 While Corsair has found his own happiness with one of the Earth crew, Bren has loved Mersi while keeping himself apart from her – not willing to even see that she loves him as well. It takes the intervention of a big, hairy, matted dog named Fiend to show Bren that his taint is no bar to being loved and wanted, and that he does have plenty to give, and not just to Mersi. And that even the scarred and broken ones are still worthy of being loved. The message that it isn’t what you are but what you do that matters is lovely. Of course Fiend steals every scene he’s in – and that’s just how it should be. 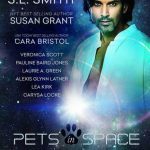 It’s no secret that I loved the previous Pets in Space collections, Pets in Space and Embrace the Passion: Pets in Space 2. 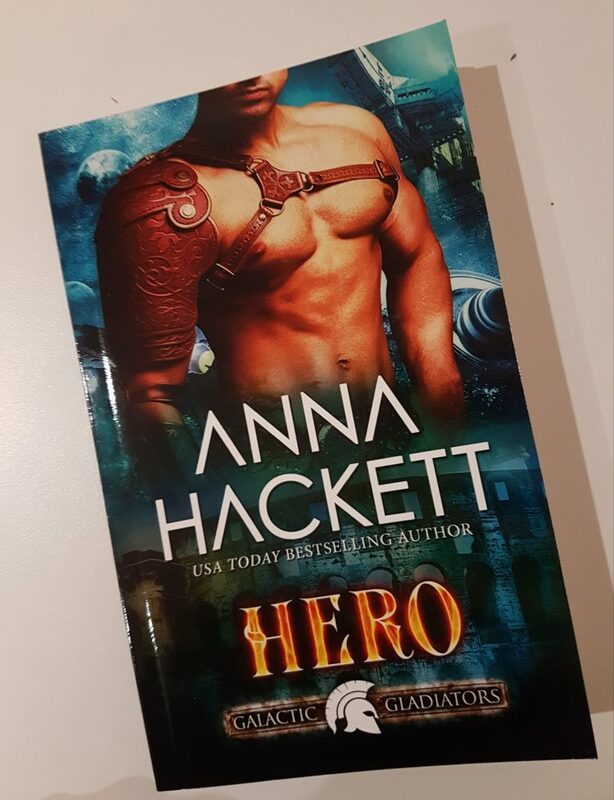 And that I also really love Anna Hackett’s work, so when Anna asked if I’d be willing to do a spotlight for the latest collection AND that she would let me host a giveaway for one of the Galactic Gladiators titles, I was all in. I would love to have a review of the entire Pets in Space 3 collection to accompany this spotlight, but the book just came out yesterday and even I don’t read that fast. Besides, I do love these collections and want the chance to savor every story. So, just to whet your appetite a bit, take a look at the descriptions of the rest of the stories in this collection – then get them while they’re hot! Or cool, or lukewarm, or whatever body temperature each member of this intergalactic menagerie prefers. And don’t be put off by the stories that are series entries. Like Desert Hunter, these are meant to serve as introductions to their series – not that you won’t want to add the rest of each series to your TBR pile the minute you’re finished. I know I will! Prince Walkyr d’Rojah’s mission is to find an ancient artifact known as the Heart of the Cat, a revered gem that holds the mystical power that connects his people with their cat-form. He isn’t the only one searching for the Heart. A secret sect determined to overthrow the royal families wants the power contained in the gem, and they are willing to do whatever it takes to obtain it. Trescina Bukov’s affinity and ability to care for large cats has taken her all over the world. A frantic call from a rescue group compels her to fly to Wyoming in the western part of the United States. She is confused and wary when she discovers the injured leopard is more than he seems. Walkyr is shocked when the human female caring for him connects with his leopard and recognizes who he is. 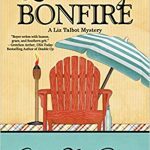 Now, he has to contend with the assassins who followed him, his leopard who wants to claim the woman, and find out why all the clues in his search for the Heart of the Cat are pointing to a planet so far from home. When Walkyr discovers the secret that Trescina has been hiding, he is forced to make a difficult decision: let her go, or kidnap her and return with her to his world. Can Walkyr convince Trescina that their lives are bound in more ways than one or will she flee, taking her secret and the future of the Sarafin species with her? When Chanda decided to finagle her way into a job she wasn’t qualified for, she didn’t expect to end up on a ship full of hulking mercenaries. They’re rude, crude, and so covered with scars and tattoos that she can’t imagine any woman being interested in them. Except perhaps for the soft-spoken doctor with the haunted eyes. She would love to know more about him, especially since he stares at the game logo on her T-shirt rather than her breasts, but a little problem comes aboard the ship at the same time she does. Quashi. Furry alien fluff balls with stubby legs and very expressive antennae. Are they harmless – or a danger to the ship? And why were they in a box labeled lab rats? When some of the creatures go missing and systems start malfunctioning, Chanda is assigned the task of quashi wrangler. Though she’s worried she isn’t qualified, the intriguing doctor is also sent to help, and she’s determined not to fail in front of him. Maybe this is her chance to find out what network games he plays and why his past troubles him. But as the lights flicker and the ship’s life support systems are threatened, Chanda realizes there might not be time for romance. If they can’t round up the missing quashi before it’s too late, she may never see home again. Tassia Megg is a woman on the run after the death of her elderly guardian. Her search to get off the planet in a hurry comes when chance directs her to an open dance audition for the luxury cruise liner Nebula Zephyr’s resident troupe. If there is one thing Tassia can do, it is dance! Security Officer Liam Austin is suspicious of the newest performer to join the Comettes. She shows all the signs of being a woman on the run and seems to fit the Sectors-wide broadcast description of a missing thief, accused of stealing priceless artifacts. As he gets to know Tassia during the cruise, he starts to wonder if she’s something more – a long vanished princess in hiding from deadly political enemies of her family perhaps? And what’s the story with the three-eyed feline companion other crew members swear Tassia brought aboard the ship? Does the animal even exist? As the ship approaches its next port of call, all the issues come to a boil and Liam must decide if he’ll step in to help Tassia or betray her. Life is about to get very interesting aboard the Nebula Zephyr as Liam tries to uncover the truth. Could F’rrh, the peculiar alien cat he has been hearing about, be the key to the mystery and Tassia’s fate? She’s a USMC Sergeant deployed to the Garradian Galaxy. He was raised by the robots who freed him from slavery. They clashed as enemies but joined forces to defeat a common foe. Now they’re tasked with returning some freed prisoners to their home worlds. In the next galaxy. With an alien, a robot, and a caticorn. It was a bar joke without a punch line, though Carolina City has a feeling it is out there—like the truth. Kraye isn’t eager to return to his galaxy where the dark secret of his past lays in wait, but he’s willing to risk it in hopes that Caro can teach him what the robots couldn’t: how to be human. 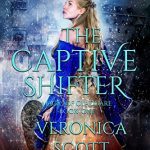 Together they must face a dangerous journey, a lethal enemy with a score to settle, their unexpected desire, and an uncertain future if they make it out alive. Can Caro and Kraye navigate the minefields—both emotional and space based—to land a happy homecoming for the sentient animals in their care? Can the man raised by robots learn how to kiss the girl while the starchy Marine decides if she is willing to bend the rules for a happy ever after? Don’t miss Pauline Baird Jones’ newest Project Enterprise story! Military Sub-Captain Kedron Tauceti counts the days until he can leave the rare metals factory and his current duty station as the liaison to the Criminal Restitution and Indenture Obligation system. The post was protection—and punishment—for exposing a theft ring in his previous assignment. He’s more than ready to get his career back on track on a new base halfway across the galaxy, even if it means leaving behind the one person who makes him want to stay. Not that he’s told her, because technically, he’s her warden. Former financial specialist and current indenturee Ferra Barray, hiding from her past, only has three months to go on her restitution sentence. She’s lucked into a tech repair job, and If she keeps her head down, she’ll be free to figure out her future. Unfortunately, the local boss behind every illegal scheme in the facility wants her to steal for him, and she’s running out of excuses. And now the heroically handsome Tauceti, who she hoped could help, is transferring out. Everything changes when Ferra discovers two genetically modified cats. Saving them takes incredible risks. She doesn’t know what she’ll do if she can’t convince Tauceti to take them with him and keep them until she’s free to come for them. When trouble erupts at the factory, it might just be the cats who save them. Find out what happens in this exciting stand-alone novella from Carol Van Natta’s award-winning Central Galactic Concordance space opera series. Randall Laster crossed Halora to hunt the kraken, sea monsters that weren’t supposed to be real. Betrayed by men he trusted, he was left to die. Instead, he finds himself living with the beings once meant to be his prey. Randall struggles to find his place amongst the kraken and to find a purpose to the new course his life has taken. Hope comes in two unexpected forms: an injured, amphibious sea creature in need of care, and Rhea, a strong-willed kraken who’s made no secret of her interest in him. Can he reconcile the tensions between humans and kraken and look beyond their differences so that he can claim Rhea as his own, or will old prejudices and hostilities tear them apart forever? Starway is an interstellar hotel that offers guests something to satisfy almost any wish—even wishes they didn’t know they had. Nikka Steel is a lonely interstellar pilot. Danyel Parry is a wealthy passenger’s mistreated consort. 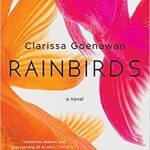 When they find each other in Starway, they discover how much they have in common, including remorseless enemies and resourceful friends—one of which has four paws—and mutual attraction as perilous as it is powerful. Danyel and Nikka soon realize that they have a hopeful new destination. The interstellar crossroads at Starway can take travelers to many places, some of which are strange and secret. To get there, though, they will have to find their way through anger, danger and—even more frightening—change. Zandro alienated the love of his life years ago with one giant mistake. Consumed by his animal rescue work, he didn’t realize what he had given up until she was gone. 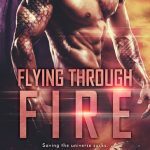 Now, his work to save two alien kittens with dangerous pheromones will reunite him with his old flame – and hopefully give him a second chance. Aliette’s work as a space captain keeps her mind off of what she lost – Zandro – or it did until she receives his desperate plea for help. She reluctantly agrees to assist him for old time’s sake. But the simple transport mission quickly escalates into a fight for survival. The local drug cartel has discovered the unusual kittens and will do anything to obtain them. With dangerous events and concern for the vulnerable kittens drawing them close again, Aliette will have to decide if being with Zandro is worth sacrificing everything for – even her life. A’ryk Chiste of Korth marooned himself on an uninhabited world for a reason. He doesn’t want to be reminded of a galaxy where his people lost the war, taken over by the merciless Invaders who changed his life forever. A galaxy where he failed at the one thing he was born for, to protect worlds. He wants no part of the shaky forced ‘peace.’ So when an Invader crashes onto his planet, the simple solution is to let her die. But his furry companions have other ideas. Lyra Merrick is a surveyor for the Earth Council of Habitable Worlds. She searches for and reports planets that can be terraformed for human survival, comfort and stability. It is business as usual when she finds another planet in a little-known section of the galaxy. A routine mission turns into a fight for survival when her ship has a malfunction and she crashes to the icy, unrelenting world. When she comes to, she hears a voice in her head. Confused, she wonders if the lonely existence of a surveyor finally made her crazy. Not only is she hearing things, her eyes are deceiving her too, because she’s in the domicile of the sexiest man she’s ever seen. 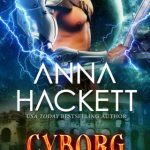 I’m very happy to say that I am giving away a signed paperback copy of one of my personal favorite books in Anna Hackett’s Galactic Gladiators series, Hero to one lucky commenter on this post! 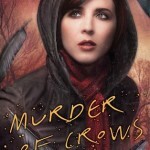 Anna lives in Australia – so this giveaway is open to ALL! I would like her to be able to read my mind and know what I want her to do. I purchased this with some an amazon gift card I won. I only do KU but HAD to have it. Thank you so much for letting readers know about Pets in Space 3! My dog Bogie is extraordinary and very sensitive to people. He can sense whom he can trust and whom to stay away from. I would love for him to have the superpower to cure people from their ills. I read the first two stories in the anthology yesterday and I really wish they hadn’t started it with the S E Smith one. It was tough going for me. There was way too much backstory for a short story and I kept getting confused about who was who and why it mattered. Short version: a lot of didn’t matter to me. A ton of the worldbuilding could have been left out with no loss whatsoever. The plot/characters central to the story were great, but just too many story distractions! I would love if my cats had the power of Speech so we could talk to each other. I would love for my cats to be able to talk! To talk. Then I would know why it’s always meowing. I also enjoyed the other 2 Pets in space and look forward to reading another one if it comes to fruition. I can’t wait to dive into the latest anthology. I’ve found so many new-to-me authors and have started reading SF Romance thanks to the last one. It would be awesome if cats were actually familiars and could amplify magic.